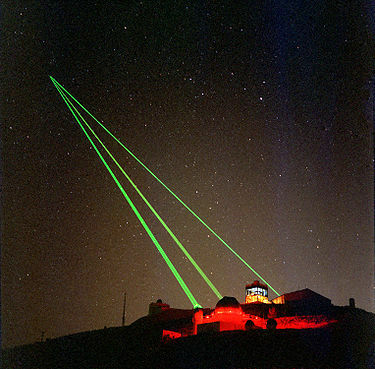 Three green lasers fire into space from the Starfire Optical Range at Kirtland Air Force Base, New Mexico. Operation Vittles, better known as the Berlin Airlift, was launched on 24 June 1948 in response to the Soviet blockade of West Berlin. The airlift continued for fifteen months, until 30 September 1949. Flying primarily C-47 Skytrain and C-54 Skymaster aircraft the USAF delivered a total of nearly 1,783,573 tons of supplies. The Royal Air Force delivered a further 541,937 tons totaling 2,326,406 tons on 278,228 total flights. Through the course of the operation seventeen USAF crashed resulting in the deaths of 31 personnel. The airlift directly resulted in the failure of the Soviet policy and an early Cold War victory for NATO. The P-80 Shooting Star was the first jet fighter used operationally by the United States Army Air Forces. It was introduced into active service in July 1945, during the closing weeks of World War II, however, the aircraft did not see combat during the war. The Army Air Forces, and later the Air Force, acquired more than 1,700 of the aircraft before the end of the production run in 1950. The aircraft saw extensive action during the opening phases of the Korean War. However, as the more nimble F-86 Sabre came into service the P-80s were primarily assigned to ground attack and photo reconnaissance roles. The P-80 design was the basis of the T-33 Shooting Star trainer aircraft. The Shooting Star airframe became the primary jet trainer as the Air Force migrated to more advanced fighters. General Teed Michael Moseley, KBE, was the 18th Chief of Staff of the United States Air Force. He assumed the position during a ceremony at Andrews Air Force Base on September 2, 2005. As Chief, he served as the senior uniformed Air Force officer responsible for the organization, training and equipage of more than 700,000 active-duty, Guard, Reserve and civilian forces serving in the United States and overseas. As a member of the Joint Chiefs of Staff, the general and other service chiefs functioned as military advisers to the Secretary of Defense, National Security Council, and the President. He resigned from his position in June 2008 following a serise of incidents involving nuclear weapon security. ...that the Order of the Sword was first awarded in May 1967? It is the highest honor the Air Force enlisted corps can bestow upon an individual. The Order of the Sword is typically presented to senior Air Force officers in recognition of their dedicated service. Schwartz, General Norton A. (September 3, 2008). "Fly, Fight and Win!". CSAF's Vector. United States Air Force. Retrieved February 19, 2009.